Wonderful Modern style solid silver collar necklace with 925 sterling silver slide pendant with oval hemotite cab. Penadant marked 925 Espo Sic. Not sure of the company. This is beautiful and quality made heavy silver. 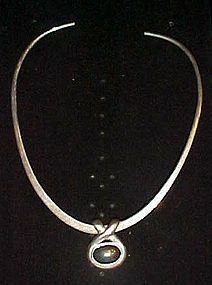 Pendant can be easily removed to use another of your own choosing. Comes in nice velvet box. 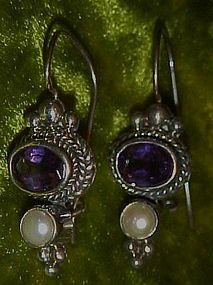 Beautiful amethyst stones set in a finely crafted sterling silver setting. Marked 925, Earrings are 1 1/4" long plus the ear wire, which makes them hang to 2" long. Brand new and gorgeous detailing. 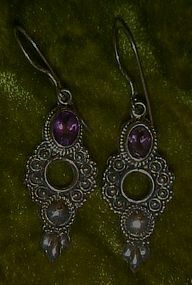 These beautiful earrings are made of fine crafted, heavy sterling silver (marked 925). Large wires for pierced ears. Real amethyst stone, and a real pearl, Earrings measure 1" plus the wire which will make them hang to about1 1/2" long.These weigh .33 ounces!! These have never been worn, and are wonderful!! Nice sterling silver (925 stamped) earrings have clip on backs and are nicely detailed. 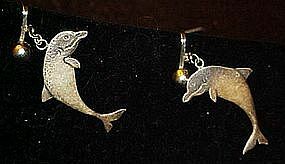 Each dolphin measures 1 3/8" long plus the clip. I have not polished them.Could easily be converted to pierced if you need to. These exquisite little hummingbirds are sterling silver and have a southwestern flair. 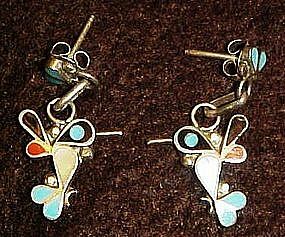 Inlaid with sections of turquoise, onyx, abalone or mother of pearl, and coral These little post pierced earrings are adorable and in excellent codition. 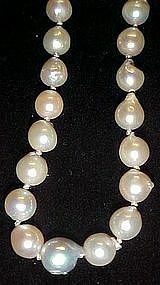 Measures 1 1/8" long, overall. 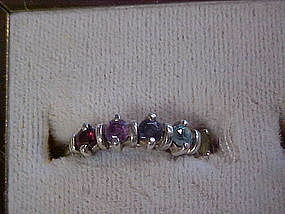 Pretty sterling silver band witgh 5 stones. citrine, amethyst, smoky topaz, blue topaz and garnet. Ladies size 7. Marked 926 with a jewlers hallmark. 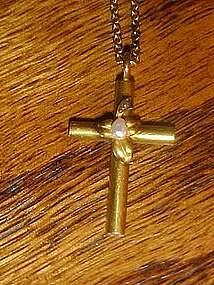 Genuine gold cross measures 3/4" x 1 1/4". Has a real white pearl center and the tiniest real black pearl on the upper leaf. (Had to use the loop to see it). Not sure if the chain is real gold, but it is included at no extra cost. 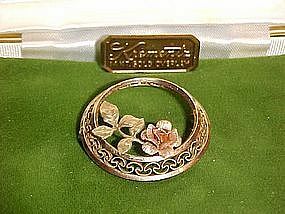 Vintage Krementz pin with rose and gold color single rose. 14 kt gold overlay. Circular filigree edge. Marked Krementz on the pin stem. Measures 1 1/4" in diameter. Perfect condition and comes in the original Krementz box. Known for their fine costume jewelry, you can buy this with confidence that you are buying a reputable piece of jewelry history. 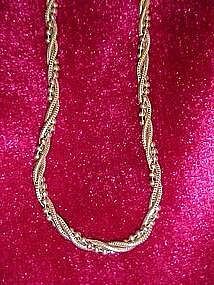 Beautiful Italian sterling triple twist chain 18"
This s one of the prettiest chains I have encountered. Unclasped it measures 18". Good weight,marked 926 GLO Italy. Nice clasps. Triple twist of three chains to make this one. Stunning! !